As awesome as grids are though, creating your own custom grid in Photoshop is a tediously time-consuming process. Sure, you can use prebuilt grid systems, but if you need more flexibility and customizability, then developing your own grid is the only option. This is where Griddify helps. 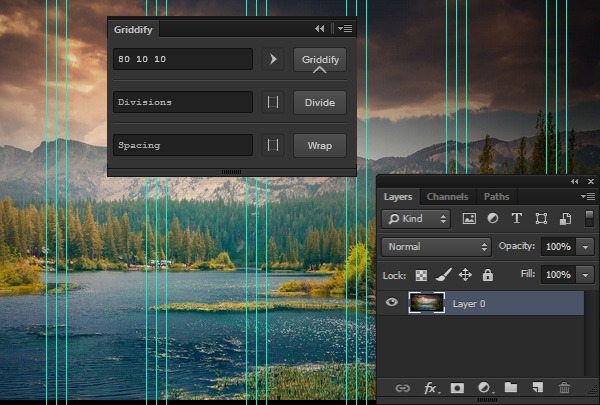 Griddify will help you establish a custom grid using Photoshop guides. This tool will save you lots of time and it also takes out the need to manually perform calculations for your grid’s spacing, divisions, widths, heights, etc. Griddify is free and open source (its source code is available over at GitHub). It was built for the Adobe Creative Cloud (CC), but a CS6-compatible version was just released. CS4 and CS5 compatibility is in the works.